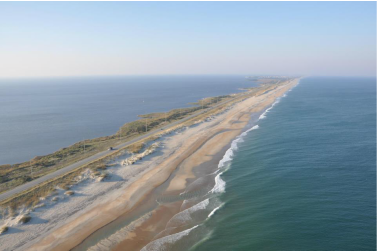 Hatteras has more than 60 miles of beaches forever protected as the Cape Hatteras National Seashore. Eighty percent of the island is preserved and protected from the possibility of man-made development by the National Park Service. All of the beach and most of the soundfront marshlands are protected as well. As you approach Hatteras from the north, you pass through 25 miles of wildlife refuge before you see the first signs of civilization. Pea Island National Wildlife Refuge consists of more than 33,000 acres of water, marshland and ocean beach. It is a haven for almost 300 species of birds and a resting place for migratory waterfowl. 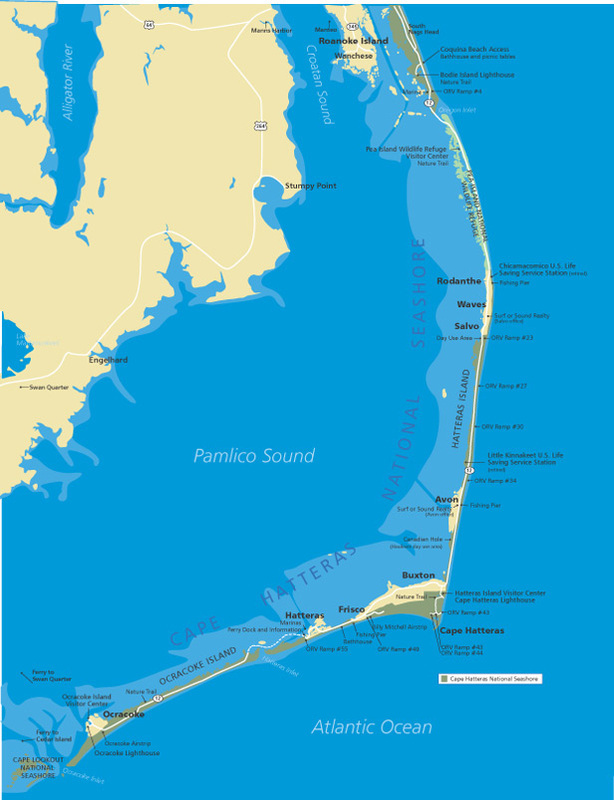 It serves as a buffer between our island and busy Nags Head to the north. Buxton is home of the Cape Hatteras Lighthouse ... the tallest in North America. She has marked this cape since 1870 to warn ships of the treacherous shoals. America's astronauts were told to watch for the hook of Cape Hatteras when flying over the East Coast of the United States. The Cape is such a prominent feature it can be spotted from hundreds of miles out in space yet earthly mariners named it "The Graveyard of the Atlantic" because of their difficulties in negotiating her turbulent waters. The surf's nearly always up on these beautiful beaches. South of Buxton and through Frisco is Hatteras Village, one of the largest communities on the island. Hatteras is our commercial and sports fishing center. A large fleet of charter boats operate, inviting you to Hatteras Inlet and to the nearby Gulf Stream waters for exciting deep sea fishing. Blue marlin, white marlin, dolphin, sailfish, wahoo and others could become your catch of the day.